Renowned for his socially focused projects, this new project aims to generate debate around the complex nature of children’s play and to advocate for improved provision for this universal right, as identified by the UN in the 2013 General Comment on Article 31 (the Convention on the Rights of the Child). At a time when up to 13 million children have been internally displaced as a result of armed conflict, and traditional public space is being privatised, Child’s Play reinforces our responsibility to ensure that children the world over have full opportunity for play and recreation. The exhibition presents a series of Neville’s photographs of children at play in diverse environments around the world. Immersing himself in communities from Port Glasgow to North London, and in the war zones of Afghanistan and Ukraine, the artist has captured beautiful moments of free, spontaneous play. On display are new photographs of internally displaced children in Ukraine; residents of Kakuma, Kenya’s second largest refugee camp; and depictions of children at play in London adventure playgrounds, all made especially for this project. Neville’s work challenges the romantic ideal of play with the reality of children’s lives, which is often harsher and more complex. Through his photographs he captures children’s spontaneous urge to play and their determination to do so in the most unfavourable environments, revealing how through play children claim a place of power, safety and freedom. In the context of the Museum, the idea of spontaneous play is set against the institutional play evidenced at the Foundling Hospital. 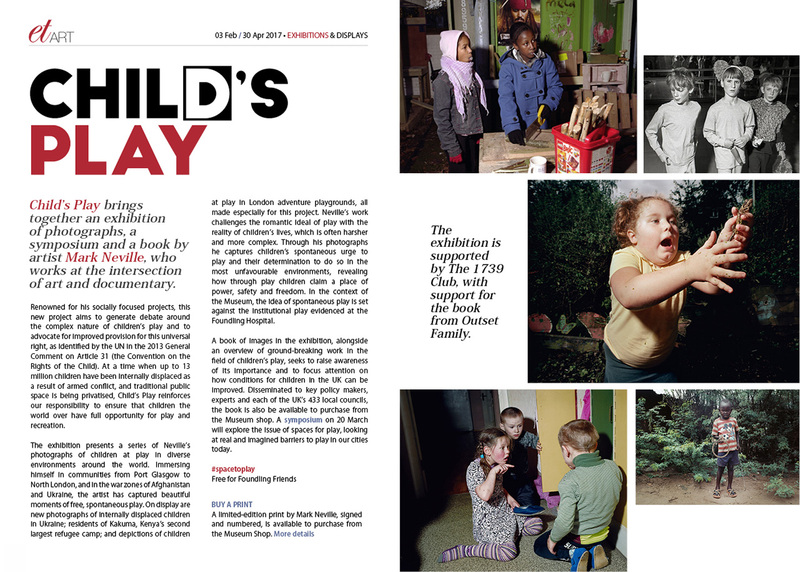 A book of images in the exhibition, alongside an overview of ground-breaking work in the field of children’s play, seeks to raise awareness of its importance and to focus attention on how conditions for children in the UK can be improved. Disseminated to key policy makers, experts and each of the UK’s 433 local councils, the book is also be available to purchase from the Museum shop. A symposium on 20 March will explore the issue of spaces for play, looking at real and imagined barriers to play in our cities today.